Summary: I’m afraid you couldn't get more average than Susan and Daniel. The ending was good. But I’m not allowed to tell you about it. All I can say is it was surprising and courageous – if only such effective moments and innovation had been applied throughout. 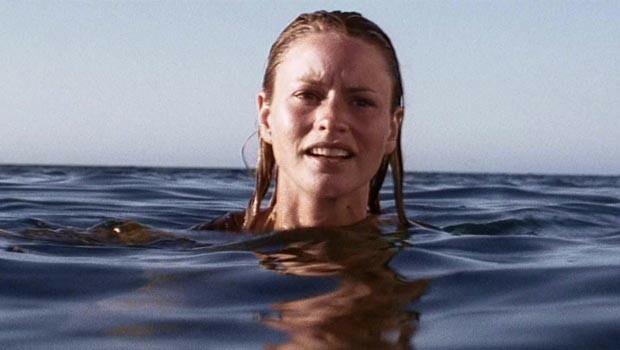 Unfortunately most of the film was quite tedious – despite being about sharks encircling a couple abandoned at sea. The tension just wasn’t there and the characters were undeveloped and hence rather boring, which didn’t help matters. As they were the focus of 99% of the action, such as it was, you can imagine how annoying this was. Despite being based on a real life incident writer, director and editor Chris Kentis (he’s the one to blame then) states “I wasn’t interested in capturing the real people involved… I did no research on them”. Perhaps he should have remembered to include some personality for the new characters he invented. One scene had cringe-worthy echoes of Titantic. Susan and Daniel search ‘desperately’ for each other after drifting apart – but their half hearted attempts at calling each others’ names does not convey any distress. Rather than being sensitive and moving it was clumsy and embarrassing. The dialogue between the couple was equally dull and could have been written by a thirteen year old. Random wildlife and nature shots were lovely – but rather random. Equally the underwater scuba-diving sequence was cool – but pretty unnecessary to the storyline – such as it was. In fact the film didn’t need to be feature-length at all, a short could’ve easily conveyed the same content. The Caribbean backgound muzak (didn’t quite qualify to be a soundtrack) again was a nice distraction. But didn’t fulfil what I can only imagine its role was – to contrast the relaxed holiday atmosphere with the horrors of mid-ocean abandonment in shark infested water. Instead it made you want to get up and dance instead of watching the boring folk splashing about on screen. Perhaps film students will dissect the film in class and decide it symbolises marriage – a committed couple bobbing around on the uneasy seas of Life – after all it systematically explored all the elements of a traditional marriage: co-dependence, support, a united front, squabbles, blame, separation by death… but your average married couple doesn’t make for scintillating entertainment and I’m afraid you couldn’t get more average than Susan and Daniel.